K.R.K. Govt. 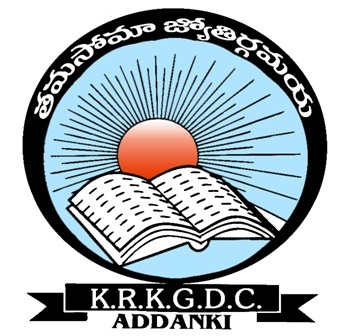 Degree College, Addanki, is one of the oldest and reputed institutions in Prakasam Dt. Andhra Pradesh, India. This college was established on 20th December, 1984 by the Government of Andhra Pradesh to cater the needs of the students of this area. It is situated on the hillocks of Singarakonda in the outskirts of Addanki, Prakasam Dt. With beautiful landscape. Addanki is a famous historical and pilgrim shelter. The “First Telugu Inscription” was traced out during the archeological excavations. The famous temple for Hindu God Lord Prasannanjaneya is situated here. Addanki is a backward area and most of the people here depend on agriculture. The people of this area had to send their children for pursuing higher studies at distant places like Ongole,Narsaraopet and Guntur. In the year 1982 people of Addanki felt the need of a degree college, Some prominent personalities like late Sri Karri Veeraghavaiah, Sri Katta Rama Koteswara Rao and some other likeminded people formed a committee with Sri Kari Veeraraghavaiah as convener and because of the unstinted efforts of the committee, Government accorded permission for starting a Government Degree College at Addanki in 1984. Sri Katta Rama Koteswara Rao, a farmer has generously donated an amount of Rupees 2 lakhs as corpus fund for the establishment of the college and the college is named after him by the Government. Permission was accorded to open a Government Degree College at Addanki by the Government of Andhra Pradesh vide G.O.Ms.No.509 Education Department Dt. 28-11-1984. The College was affiliated to Acharya Nagarjuna University. This College was recognized by the University Grants Commission Act under 2(f) and 12(b) College was accredited at B level. 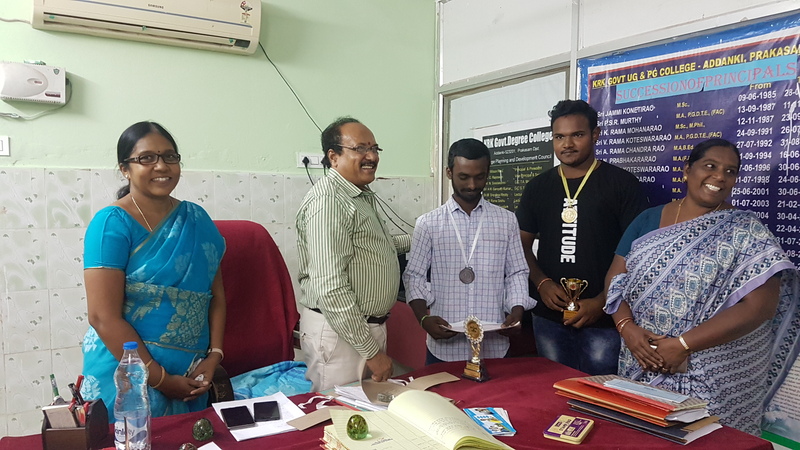 This college has been imparting education to the poor and down trodden, under privileged sections of the society of this region for the last 25 years successfully overcoming all the constraints. This college is spread over an area of 21.5 acres of land situated at the suburbs of Addanki on the state highway of Hyderabad and is nearer to singarakonda, a famous pilgrim center of Lord Prasannanjaneya Swamy. Now the college is running successfully with Potential, JKC programme, 2 NSS Units, Red Ribbon Club, and Women Empowerment Cell apart from 20 well ventilated Class rooms, 6 Science Labs, 3 Computer Science Labs, 3 e-Class Rooms with modern projectors, Smart board. The College has big play ground of 10 acres, with well equipped GYM and Sports facilities. Sri Jammi Koneti Rao, a famous scientist and first principal of the college has extracted the precious words “THAMASOMA JYOTHIRGAMAYA” from “BRUHADARANYAKA UPANISHAD” as the college motto, it means “LEAD US FROM DARKNESS TO LIGHT”. He also designed the emblem of the institution which enshrines the high ideals of offering the light of education to this backward area. The rising Sun and the open book symbolize the objectives and goals of the institution. The Sun is the harbinger of light which is one of the sources of life. He shatters the darkness of ignorance and showers the light of knowledge. The white light of the Sun which is composed of seven colours represent the knowledge, discipline, dedication, honesty, equality, freedom and patriotism. The blue colour symbolizes the vast region of knowledge in the universe, to be acquired by the students of this institution. Book is the beacon light that can guide the learners to the shore of glory, peace, prosperity and happiness. To provide Higher Education to the students of this rural and backward area. To enable the poor and down trodden/ under privileged sections of the society an access to gainful employment opportunities by imparting skill oriented education. To inculcate human values and social responsibilities. To mould the students as good and useful citizens of India.